I had something of a revelation recently, when I took to my brand new electric bike to explore Cornwall. For anyone who has never followed my blog before, as Action Nan, I love to prove that it’s great to get out and about and enjoy adventures around our beautiful county even as I get a little more mature in years! Two years ago I walked around the entire Cornish section of the South West Coast Path in one continuous journey to raise funds for the RNLI and although it was challenging, I relished the adventure, the peaceful moments entirely alone in the beautiful coastal landscape and the joy of discovering places and stories I had never encountered. I love walking, but as the Cornish hills get a little more challenging, I have discovered a new found freedom thanks to my electric bike. I took it out to explore the Clay Trails around St Austell recently, but I’ve also discovered that the bike is a wonderful way to help me get out to those forgotten lanes and lay-bys which are in desperate need of a litter pick up. It’s only natural in Cornwall that we should feel drawn to clean our beaches, and it has been inspiring to watch organisations and individuals rise to the challenge of keeping our coastlines clean. Last year I founded the Final Straw Cornwall campaign with the aim of encouraging hospitality businesses to stop serving Plastic straws and undertook to do 52 beach cleans in 2018, details of which can be found on the Final Straw Cornwall Facebook page. Beach cleans here in Cornwall have been the focus of much attention but areas inland, can tend to get forgotten and overlooked. It’s an issue which my good friend Wayne Dixon, who is walking around the UK litter picking with his dog Koda, raised when we met during his time in Cornwall. With my new bike, I have been able to go out and find many lanes, lay-bys and areas which need cleaning. 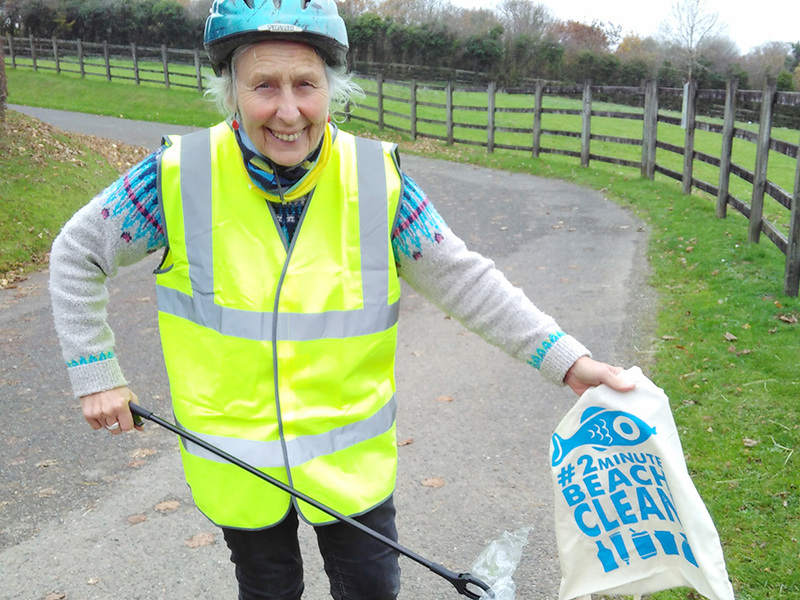 I pick up as much litter as I can carry in my pannier bags and take it to the nearest bin if I need to reload, or home where I can sort it for recycling. It’s important everywhere. But in Cornwall, where we are never more than 20 miles from the sea, picking litter up inland is vital if the rubbish, and the plastics that get left in lanes and inland areas are not going to be rain-washed down drains and streams out to sea too. The county’s geography means that our river valleys are short and often steep and it takes very little time for a piece of plastic dropped inland to reach the coast. I hope to raise awareness and support for cleaning up our towns and villages, roads and lanes inland in Cornwall so that we can all support the good work done by the beach cleaners and SAS Plastic Free Communities. 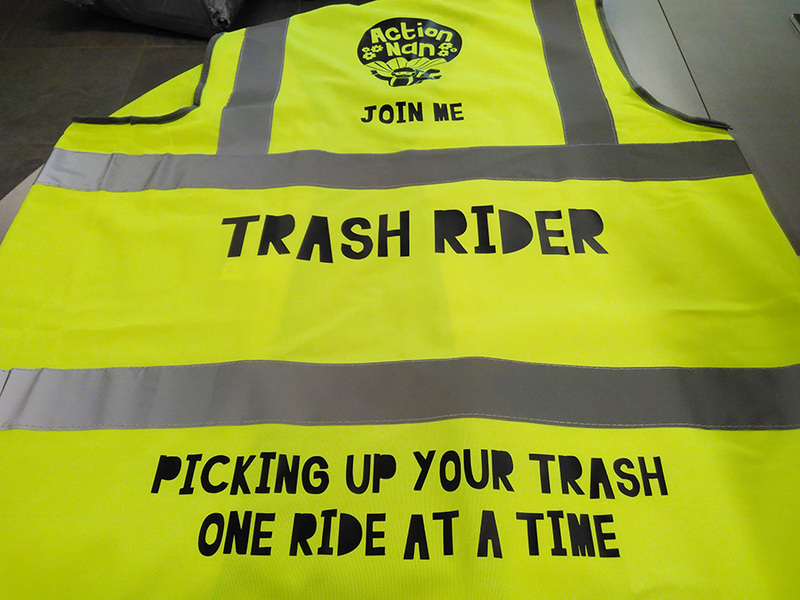 For now, if you see me in my Action Nan Trash Warrior tabard, out on my bike, remember, I’m not picking up my litter, I’m picking up all of our litter, and it would be truly wonderful if you could take a few moments to help, or pick up litter on your travels too.